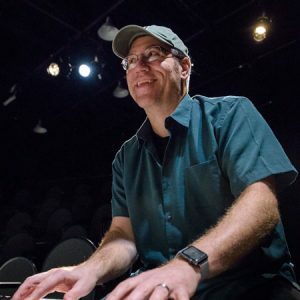 Travis Charles Ploeger joined Washington Improv Theater in 2006, after an eight-year career as the musical director for Chicago City Limits, at that time the longest running comedy revue in NYC. During his time in the Big Apple, he also performed regularly at the Upright Citizens Brigade Theatre and the People’s Improv Theater, and helped create “I Eat Pandas” with Eliza Skinner and Glennis McMurray (McCarthy). His fond non-improv musical theater credits include music directing Loretta “Hot Lips” Swit at the Forestburgh Playhouse, as well as clowning around on a white baby grand onstage nightly in Constellation Theatre’s production of SCAPIN, right here in DC. A graduate of the Hartt School of Music (University of Hartford), he has since helped to create and perform approximately 2,000 improvised musicals across the country. That fact impresses his wife (Melissa) and two boys far less than he believes it should. He is also a season ticket owner for the Minnesota Vikings, and has yet to turn down a chance to visit a tiki bar. Follow him on Twitter here. Travis is the director and accompanist for iMusical. Travis Charles Ploeger is the creator/director of the popular and critically-acclaimed WIT production of iMusical: The Improvised Musical. He has also written and performed music for other WIT projects including several of their 48-Hour Film Festival entries. A working director/performer in NYC for more than a decade, he was the music director and pianist for Chicago City Limits (both resident and national touring companies) from 1998 until 2006. He was also a founding member of “I Eat Pandas,” with Eliza Skinner and Glennis (McMurray) McCarthy, and is a veteran of the stages of the Upright Citizens Brigade Theater, People’s Improv Theater and Magnet Theater. He is a graduate of the Hartt School of Music, a season ticket owner of the Minnesota Vikings, a passionate Washington Nationals fan… and has either accompanied or music directed in approximately 2,000 performances of improvised musicals… and counting. He also has yet to turn down the chance to visit a tiki bar. Follow him on Twitter here. All you are is your word.